Tim Sult is quite the lean, keen-edged musician. As Clutch’s lead guitarist for over 20 years, this riff beast has allowed little waste or flamboyance. His attack cuts clean or moves jagged intentionally. There’s something of a chef’s knife control to Sult, where the happy accidents occur in the development process and what follows on record or stage is pure intention. 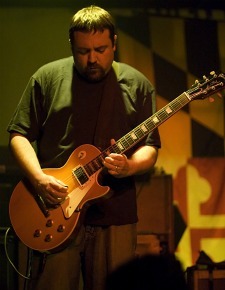 His solos are models of brevity but his presence is felt just as powerfully in the tone and texture of Clutch’s music. He’s always there, or lurking nearby, moving hard towards you or hanging back for a well-timed moment before lunging back in. To say he’s a master of “feel” is a bloody understatement, and it’s to be wished that more guitarists looked to Sult as a role model than spark-tossers like Eddie Van Halen and Joe Satriani. The diversity of Sult’s playing has rarely been as well showcased as on Clutch’s recent reissue of Blast Tyrant (released April 26 on the band’s own Weathermaker Music), where what was already an evolutionary album for the band (and Sult in particular) gets a bonus disc of acoustic tracks and raw-but-right demos called Basket of Eggs. The acoustic tracks expose Sult in a way the all-enveloping Clutch sound doesn’t usually allow, and what’s clear is he’s got real blues in his bones. Clutch’s last studio release, Strange Cousins From The West, showed the band fully capable of electrified blues-rock of the highest order, but the Eggs tracks offers a more traditional, rollicking confirmation that Clutch can add the blues to their credits along with punk, metal, hard rock and hip-hop. Clutch hits the road again starting July 20th in Brooklyn. Find their full itinerary here, and jump inside to see what Tim had to say to our seven six-string questions. I like the reverse effect on the Line 6 DL 4 because it sounds as close to an actual tape reverse as I’ve heard out of a modern pedal. Gibson Les Paul’s and Sg’s because they sound warm and round. I’ll go with AC/DC on this one because they rock the hardest. Andy Kerr, guitarist of Nomeansno from 83-92. Playing live shows and not having my gear break down.